Oi galera! Hi everyone! I’m in São Paulo for a couple of weeks, staying on the border of the Pinheiros and Vila Madelena neighborhoods. In one direction you have gated mansions and in the other it’s vibrantly bohemian, bursting with street art and homespun enterprises, and an absurd array of restaurants of all cuisines. Like Rio, it’s hilly, but the energy and atmosphere is very different, perhaps because there is no beach! and also because as a commercial center there is a greater international influence. I played a nice choro gig at the invitation of the wonderful Trio Capitu, at JazzB. Besides that, I came with no agenda except to get to know some of the city and its culture. Every concert I went to was high quality—too many to mention—but two outstanding ones were Alexandre Ribeiro and Swami Jr playing choro and originals at the SESC Ipiranga, and Yaniel Mato’s Mani Padme trio jazz originals and improvising in a profoundly connected way at the gorgeous Casa de Francisco. Those were both in the same night and involved a complicated choreography of Metrô, Uber, and getting lost on foot in a rather dangerous part of the Centro, where some months ago a lot of unlucky people and crack addicts were evicted from their living quarters and have taken to the streets. My friend (and accomplished clarinetist) Bia Stutz and I have had plenty of experience together getting lost in foreign cities (Munich, for instance) and with the help of a few friendly bar owners closing up shop, tudo deu certo. Then I discovered my new favorite cachaça (ironically with a German name, which indicates it’s from the south of Brazil): Weber Haus organic, aged (envelhecida) in barrels of amburana wood. It was the perfect chave de ouro on a lovely evening of music and friendship. A concert and vegetarian risotto both prepared by 7-string guitarist and composer Anderson Chizzolini, who lives in the interior of São Paulo and was invited by a community of artists including multi-instrumentalist Bruno Menegatti, who recently opened a theater called Zona Franca, in the Bixiga neighborhood (though the real estate agents call it Bela Vista). After the concert and before second helpings of risotto, some friends and I had a little roda de choro e forró, jamming in the theater space while toddlers and adults mingled and sipped wine. Visiting the studio of luthiers Fabio Vanini and Adam Bahrami, and seeing their work on instruments—respectively—in the European and folkloric traditions. Having a dance lesson from my lovely host Anna Turriani, who taught me how to be the “cavalheiro” in forró. Just the basics—and I sometimes get my feet mixed up—but this gives life more options! Also having the chance to be led by her once on the gafieira dance floor, which opened up another world of dance that I am eager to discover. Practicing cello under the fruit trees in the garden (on the days that it was above 15C) with the company of a darling 8-month old German shepherd named Clementina. IMPROVISATION Pieces in a new fashion, unusual instruments, changes in programme – the Jazzweekend is good for variety. […] So in sauntering into the courtyard of “Amore, Vino & Amici” one came across Elis Roseira and Catherine Bent. The two musicians devote to Brazilian music their distinctive combination of guitar and cello, guitarist Elis Roseira also undertaking the vocal part. The pearls of a song of Chico Buarque (“A Mais Bonita”), for example, are distilled into their essence; they palpably benefit from the intimacy of the duo. 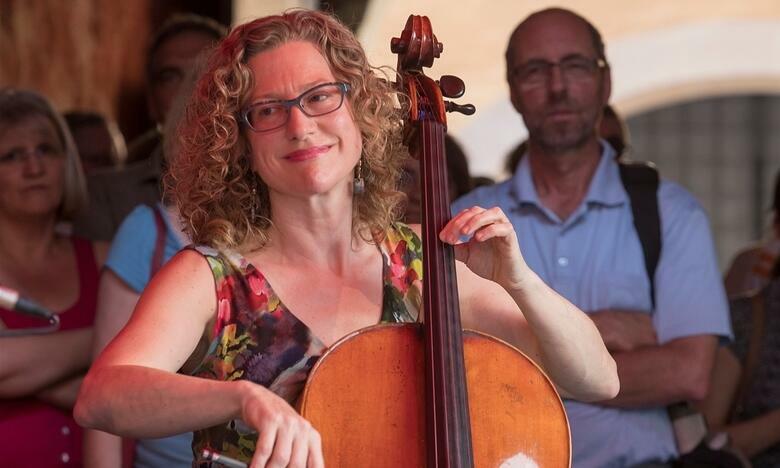 Catherine Bent is an exceptionally skillful cellist, who plays not so much in the foreground yet paints a fine cello-line contour to the whole. Elis Roseira proves that one does not need a gigantic voice in order to bring this repertory to life. Jobim’s ¾-meter Bossa “Chovendo na Roseira” is almost inscribed to her name, but even a Dylan classic such as “You’re Gonna Make Me Lonesome When You Go” (the version by Madeleine Peyroux seems to be the forerunner here) works wonderfully in this setting. This is a translation of the newspaper article that appeared on 07/11/16 in the “Mittelbayerische Zeitung”, p. 38. Yay! A tune of our album “Um Gosto de Sol” got presented on one of Germany’s biggest radio stations Bayerischer Rundfunk. Rio, a city whose c­harms and curses can’t be easily summed up. Here, I have heard the very best and the worst. Had my limits repeatedly confronted and my patience challenged….and rewarded over and over. Rio has me under its spell. Every time I arrive in Rio I feel even more at home than the previous year. The body of the city by now is familiar – the neighborhoods, the smells, the breathtaking views, and the ubiquitous sound of samba. But things shift in the musical landscape: the little bar that I used to play in every week one year may have given over to some less attractive format, or stopped music altogether. The restaurant where I went to play every Saturday would now feel repellently loud. Or a person will invite me to something where I discover a whole new group of musicians – another room in my musical house, its doors and windows tantalizingly suggesting other places, sounds, personal connections. The night I arrived I went to a roda de choro (jam session) where I met some old friends and some new ones, including a violinist and a clarinetist who had musical personalities that made me feel welcome. The next day was occupied with one of my favorite games which I call “Going Shopping for Things I Can’t Name”. This round was played for plug adaptors, coat hangers and a lampshade. Success was elusive but eventually mine. Second night I went to a samba club called Trapiche Gamboa, in an 18th century warehouse building (whose walls are really made with whale oil). This is a gorgeous space three stories high with stained glass windows, tiled walls and floor, an immense chandelier, and consistently the best examples of the Brazilian musical styles – choro, samba, jongo and more. This evening was forró and we were there to dance. But tonight was extra special because Hermeto Pascoal was in the crowd. I went and talked to him for a bit and told him that we play a lot of his music in Boston. He was very warm, and seemed pleased to hear it! Later he got up with the band and did a spirited call-and-response. Those of us there had been touched by something very special. Far from relaxing into a slow-southern kind of pace, I arrive in Rio at a sprint. My body (and the number of hours in the day) are given a run for their money by my interests. I dash around full-tilt for a week, attending several concerts each day, rodas de choro, nights out dancing. But I might suddenly crash, need to shut it all out for a day or two, to stay in no matter what day it is or what delights I’m missing. Over a couple of months I feel changes in myself; I start to adjust and let myself be carried by the flow. I’ve learned some basics of Carioca survival: take naps, stay home if it rains, and don’t make promises for later! Catherine travels to Brazil every summer to experience more and more of the diverse musical culture of this country and its people. In our website’s blog section she’ll share some of her impressions and stories from this year’s trip starting with her journey to Pernambuco..
“This is my first time in Pernambuco, and I came here curious to learn about its culture! I’m staying in the historic part of Olinda, literally surrounded by churches and monasteries that were destroyed by the Dutch in the early 17th century and rebuilt soon after by the Portuguese. I walked up the hill to take in the magnificent views (the Recife skyline and all these little hills and churches in between, and of course the ocean, beckoning to a tropical paradise). On top I ate tapioca (a kind of crepe) with shrimp, and bought some woodcuts of local scenes from a man who showed me pictures of his family and some old newspaper articles written about him and his work. I went by bus to Recife and walked to the Paço do Frevo, where I took in a great lunchtime concert where could check out the similarities and differences between choro and this local style – march music on steroids! On the top floor of the museum they have banners from local frevo blocos from many years of Carnaval. I met some friends who happened to be in town and had lunch – a feast of local specialties: casquinha de siri, caldo de camarão, queijo coalho, aipim frito as silky as tofu pillows, interesting pimenta jellies and honey to put on them, and of course a bottle of ice-cold Original, all while overlooking the ocean. On Saturday night a friend of a friend took me to a roda de choro at Bar Retalhos, in Recife. It was the birthday of the 7-string guitarist, Bozó, and the place was packed. After about an hour of burning choro from the house quartet, Bozó invited me up to play a tune, and kept me there for five more. Playing with these musicians felt collaborative, friendly, the way it does when the roda de choro is at its best; I am learning the ways as I try to contribute what I know and feel. After playing I chatted with people in the bar, including a couple who were professors of violin and cello at the State University of Pernambuco. I found much common ground with these nice, creative people, given our classical training and our interest in local folkloric music. On Monday I went to their University and gave some chamber music coaching and an informal workshop on choro. I have also seen: a Maracatú rehearsal in Olinda’s Praça do Carmo, a fantastic exhibit of Carnaval “Mamulengos” and the art of animating these dolls in improvised stories, Abilio Sobral’s store with hundreds of percussion and string instruments that he has made, and a nightclub packed full of people all dancing in unison to a band playing a steamy gumbo of samba and reggae at deafening volume.